This past Saturday, spring finally came stumbling in; when we woke up, there was still a layer of snow coating the ground, but by afternoon everything was balmy and sunny and we could finally see all of our (brown) grass again. Although we had fresh CSA goodies, not many of them got cooked; we had Pi Day and St Patrick’s Day to contend with, and we have traditions to uphold. I made hand pies and an apple pie for Pi Day, and good old corned beef and cabbage (with potatoes and rainbow carrots) for St Pat’s. 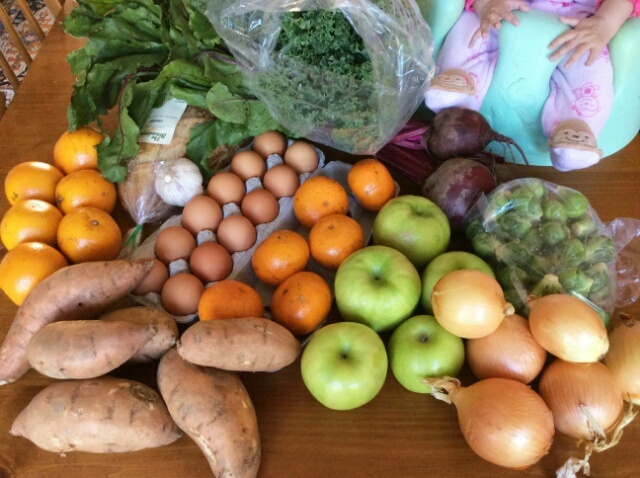 The goodies from week 2 of the CSA (most of them still waiting in the fridge): oranges, sweet potatoes, tangerines, Granny Smith apples, onions, brussels sprouts, beets, kale, garlic, eggs, and bread (Breadery sourdough). The baby is posing next to the vegetables. For scale. We used up the kale in a massaged kale salad (with tangerines and apples), and the beet greens got cooked up in some fat that I skimmed off our delicious short ribs (from Carroll Farm to Table; I’ll talk about them some other time), but otherwise most of the pickup is still sitting in the fridge. The other reason I’m behind on dealing with the CSA bounty is that it’s been a rough couple of weeks; we’ve all been fighting runny noses and sore throats for some time now, but last week the baby got a fever… and then the Little Prince got a fever… and then the baby got a fever again. On top of the nasal congestion and coughing, too. Poor kids. Hopefully we’re near the end of this round of illnesses. 1) go back in time and make a batch of chocolate chip cookie dough. I used smitten kitchen’s recipe. Heck, double the batch; you never know when a cookie emergency will strike. 2) scoop the cookie dough into balls and pack the balls on a cookie tray, lined with a silicone baking mat (or parchment paper, if you don’t have one). You can crowd the dough balls pretty tightly; just make sure they’re not touching. I use a cookie scoop for minimal fuss. 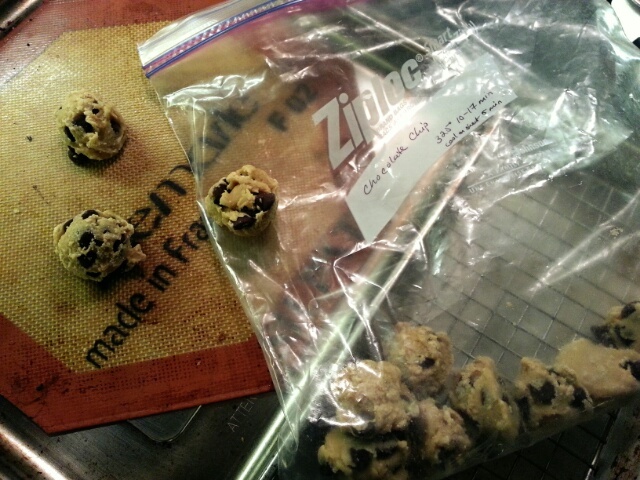 3) the next morning, put your frozen cookie dough balls into a freezer bag. They won’t stick together because they’re frozen. 5) make yourself a hot chocolate and sit down with a handful of freshly-baked, perfect little cookies, crispy on the outside but still gooey on the inside. Close your eyes and take a deep breath. Life is good. This technique will work for almost any cookie recipe, not just chocolate chip; it’s also how I managed to execute some pretty impressive cookie platters this past holiday season. 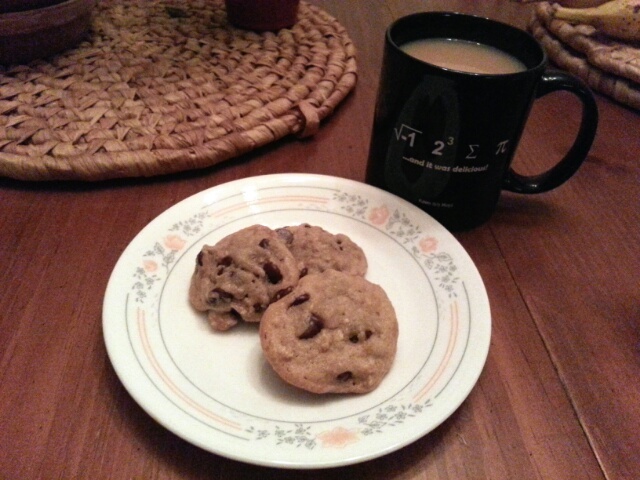 Our neighbors were impressed by how I managed a variety of freshly-baked cookies, with two young kids at home. I merely smiled and mumbled something about good time management. Now all I need is more freezer space. This entry was posted in CSA, quick eats by kat. Bookmark the permalink.